Please refer to our stock # 40G72-1695 when inquiring. 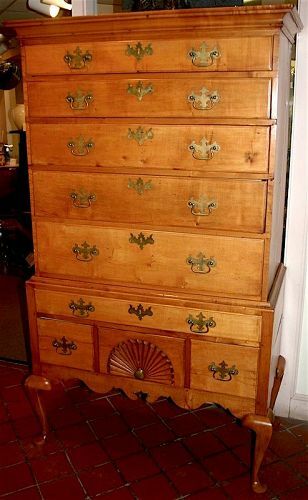 New England Queen Anne period maple highboy. 18th century. Size: 40.5 inches wide x 21 inches deep x 68 inches high. A two-part flat top highboy in solid maple with some tiger to the end panels. The upper chest has 5 graduated drawers, and the base displays a single drawer above 3 drawers, with the central drawer carved with a fan. The case is supported on cabriole legs with pad feet. The apron of the base is ornamented with a complex carved scroll design. Brasses are old replacements. Condition: refinished; some repair to drawer lips, and with age cracks and a patch to side panels. The interior has been painted at a later date.